Thank you so much for stopping by! I will do my very best to craft the most gorgeous images, and produce high quality products from the best labs and companies nation and worldwide. All sessions come with 3 steps: creative fee, the shoot itself and gallery review/collections. The Creative Fee (prices below) is paid to book and secure your date. It covers the time and talent of the Photographer, phone or e-mail pre-consultation, custom styled session, use of props, and professional post-processing and artistic editing of your private online gallery. It is due at the time of booking to reserve your date and is non-refundable. Creative Fee applies to direct family only. $25/person charge will be applied to extended family or additional individual / pets attending the shoot. The creative fee does not include any prints, products or digital negatives, which can be purchased through digital collections and/or à la Carte. The minimum investment after the creative fee is $575 (or $850 for Newborn Sessions). Clients typically invest between $800-$2000 in their custom photography session. Approximately 2 weeks following your session, I will e-mail you a link to your online gallery. You will then decide on your choice of investment. For outdoor sessions there's no travel fee within Brooklyn, Manhattan, and Queens. Outside of these boroughs a travel fee may apply. Complete Investment information is available upon request. Please contact the studio to receive our 2019 Product & Pricing Guide. The best time to contact me is during your pregnancy so that we can get everything lined up. When you book your newborn session, a creative fee is paid to reserve a tentative date based on your due date. Once your baby is born, you will then get in touch with me and we will arrange for a suitable date and time. The ideal time to photograph newborn babies is between 7-14 days of age. At this age they sleep better, love curling into the adorable positions, don’t have much colic, and usually haven’t started developing baby acne or cradle cap. Sessions are held at my home studio in Manhattan and take about 3 hours. I like to allow plenty of time for feeding and settling during the session. I have lots of props for you to choose from and I like to involve you in the styling of the session. Dads and siblings are highly encouraged to join in our session! Congratulations Mamma! You are taking part in the Miracle of Life and growing a tiny human inside of you! Many times you won’t feel all that amazing, but my job is to make you look and feel gorgeous at least for an hour or two. The best time to schedule your sessions is between 28-35 weeks when your belly is beautifully round and you still feel comfy and gorgeous. You have the option of having your session outdoors (to capture your beautiful pregnancy glow in its most natural and pure state), in studio (for an ethereal and glamorous look) or both. Dads-to-be and siblings are highly encouraged to join in our session! A family session should be like a play date for your little ones! We’ll play games, run around, and have fun! We usually start with the posed family portraits and then the focus shifts to those candid and sweet family moments. Your tiny baby is about to become a toddler and it's time to celebrate! 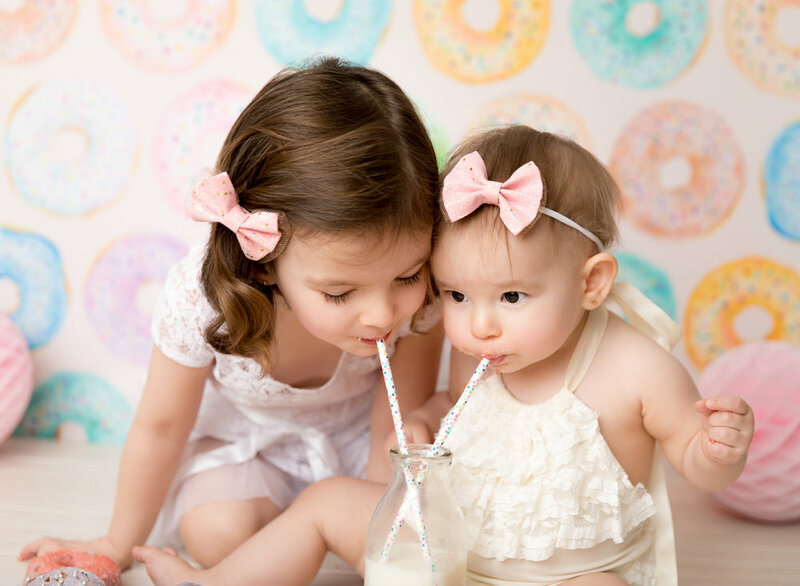 Let's give them their first taste of sugar in style! If sugar is not your thing we can always smash fruits, play with spaghetti, make art through smashing with color or whatever else we can come up with! Are you looking to gift someone everlasting memories to be cherished for a lifetime? Gift Certificates can be purchased for any photography package. Please contact me for more information. Luciana Golcman Photography is located in New York City and serves the tri-state area. Luciana specializes in maternity, newborn, baby, child and family photography.